A new book, an edited collected, has just been published by Black Dog Publishing – ATLAS: Geography, Architecture and Change in an Interdependent World. It’s edited by Renata Tyszczuk at Sheffield and three of my OU colleagues, Melissa Butcher, Nigel Clark and Joe Smith. This is part of a long-standing and on-going set of collaborations between OU Geography, Architecture at Sheffield, and the New Economics Foundation, as well as others. There is an associated web-site which archives further materials from these projects, and there is a launch event in London on March 13th, New Maps for an Island Planet. 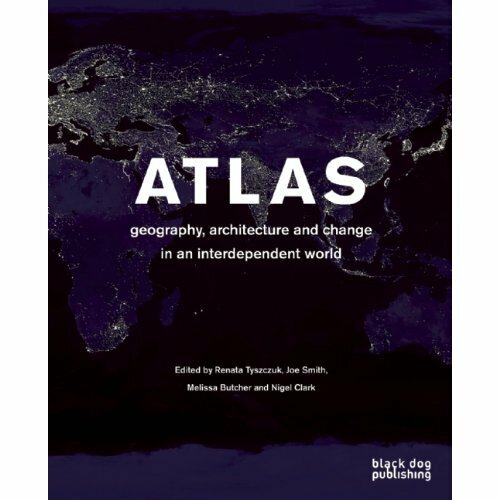 Atlas: Geography, Architecture and Change in an Interdependent World helps readers find their way through the practical and ethical challenges presented by globalisation and global environmental change. Atlas: Geography, Architecture and Change in an Interdependent World combines recent thinking on human geography and architecture on global environmental change issues, setting out to develop a reinterpretation of cartography and a reframing of sustainability. The aim is to find a “re-drawing of the earth” and the “making of new maps”. With a focus on the growth and remaking of cities it offers an innovative mix of essays and shorter texts, original artworks and distinctive re-mappings. The Atlas arises out of a unique collaboration between scholars and practitioners from architecture and human geography. This entry was posted in Books, Geography, Media, Politics, Social Science and tagged architecture, Climate Change, environment, Geography, Joe Smith, maps, Melissa Butcher, Nigel Clark, Open University, Renata Tyszczuk by Clive. Bookmark the permalink.